Walkabout - So how was Florida? The trip was indeed fun, and even just introducing The Girlfriend to some areas I’d found fascinating on previous trips was worth it. She’s not into nature photography except as a passing interest, and I try not to force anything on her or make her wait for me (too much), something that can sometimes take a long time as I wait for a shot or try to exhaust the photographic possibilities of an area. But she found Venice Rookery absolutely breathtaking and shot over a hundred frames herself there. One of the things I fretted about – that the birds would have raised their young and had empty nests by the time we visited – was needless: the birds were displaying every aspect of nesting behavior within plain sight, from building, through roosting, feeding young, to fledging out. We watched oversized young begging desperately for food from returning parents (which is typical for birds – you’d think they were starving rather than practically obese), how parent Great Egrets feed their young (an odd position I’d never seen before), Great Blue Herons sharing the task of creating a new nest, how often another Great Blue changed position and rearranged her eggs, and a sneaky Black-crowned Night Heron filching nesting materials from someone else’s nest. 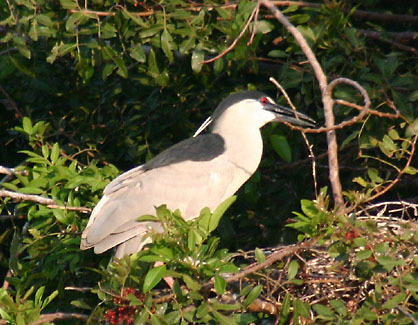 Let me pause and explain the mystique of Venice Rookery – or, to use the full name, Venice Audubon Society Rookery (I’m not dissing the Audubon Society, I just tend to avoid mouthfuls). The Rookery is a pond of, I’m guessing, about two acres that sits on public works land in the middle of Venice, Florida, itself a pretty well-developed medium-sized city. Deep wilderness it is not. In this pond sits a small island, roughly twelve meters across, so covered with trees and brush that seeing the ground takes a lot of effort – this is not an exaggeration. The island is about twelve or so meters away from the pond’s edge. And for some reason, the birds have chosen this island as the number one supercool spot to roost and nest. There is only visual access to one side of the island (or perhaps 120 degrees if you like) but from that vantage point it is possible to see at least twenty bird nests of species such as Anhingas, Snowy Egrets, Great Blue Herons, Yellow-crowned and Black-crowned Night Herons, Great Egrets, Common Gallinules, and probably a smattering of other species. The proximity of the nests is startling to anyone that knows birds – they are literally within arm’s length of one another, and when the fledglings have ventured out to stretch their wings for the first time, it can be difficult to tell which of four nests they might have left. Even more, other species like White Ibis and Double-crested Cormorants use the island for overnight roosting, so the early morning exodus as they leave to find food involves perhaps a couple of hundred birds. Go up and look at the size of the island again – and be advised that I’m trying to be as accurate as possible. Want a better idea? Go to Google Maps and put in “N27.046103 W82.400747”, then zoom in as far as it will go. That’s the island – the white specks are some of the birds. Yes, you can see them from the aerial photo. Now that you’ve got that picture, try to imagine the sound. Especially during nesting season, with fledglings clamoring for food over top of everything else. Throw in the occasional warning croak as someone inevitably comes in for a landing through someone else’s airspace, plus some squabbles over nesting materials. Anyway, safe to say this place is almost overwhelming. While you need a longer lens to get detailed portraits or behavior, you can observe without even binoculars. This location more than anything else convinced The Girlfriend to get a digital SLR – she got to use mine while I shot film. She also attempted one of the trickier feats in wildlife photography: getting a good photo of a bird in flight. She found out just how hard this is, simple as it might sound, and at the same time got a beautiful display portrait of a Great Blue Heron gliding out over the water, perfectly lit by the early morning sun at her back. It’s a stunning shot, and I’m jealous. If I had to say something bad about Venice Rookery, I’d say that most shots there are too recognizable. The setting and angles don’t change more than a smidgen, and I’ve spotted shots taken there by other photographers almost instantly. But this led to some amusement, too, when we wrapped up shooting and returned to the motel room to pack up and head further down the coast. We turned on the TV and got a special program on the Florida Birding Trail, and immediately saw footage from the Rookery we’d just left. We had much better lighting conditions than the videographers had, I must admit. If you’re a birder, nature photographer, or simply like watching animal behavior, definitely try to get there. It’ll give you opportunities that are difficult to find in most other areas. And take a picnic lunch.